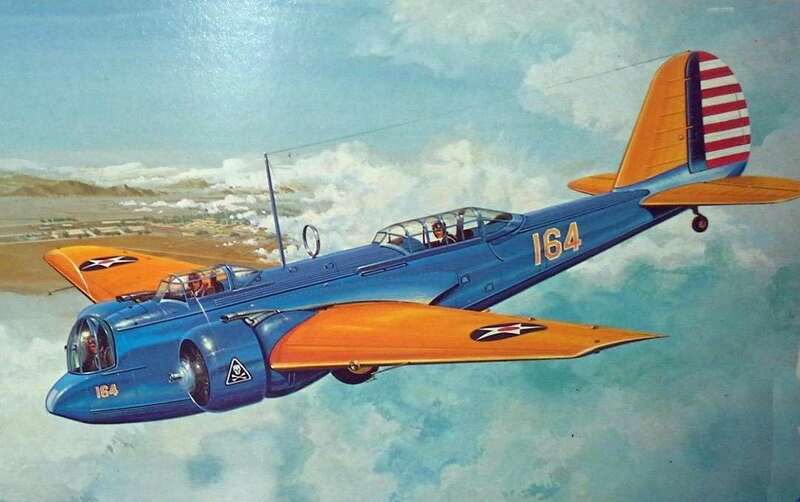 YellowAirplane.com: Martin B-10 Bomber / B-10B Model Airplanes, Airplane Kits. Martin B-10B / B-10 Model Airplanes and Plastic Model Kits. of the Prop Bomber Model Airplane Department. Great airplane models of the Martin B-10 Bomber, also B-10B Aviation Art with links to other types of model airplanes. The Martin B-10 / B-10B is a propeller bomber which is not very well known to most hobby kit builders. These model airplanes are a tremendous way to learn about the aviation industry and to learn Aviation History. Building these models are great for kids too. Model building helps build manual dexterity, teaches kids blueprint reading and teaches history and about the different parts of an aircraft. When your kids are building models, they are dreaming about fantastic futures of engineering and becoming a pilot. These are the kinds of things that kids need to learn to ensure there best future and the best future of our country. 1/40 scale model measures 13¾" in length and has a wingspan of 21¼". Hand painted and detailed, model comes ready to display on the included mahogany base. Stan Stokes. This massed flight of B-10 bombers over Boston was designed by the Army Air Service to muster public support for aviation during the between-Wars years. 16"x 11" limited edition print. The background photo on this page was taken on our 2002 North Pole Expedition. You can see more photos at the North Pole Photo Summary page.